Last month before I went on vacation to Iceland, I needed to do quite a bit of cleaning. One of the cleaning tasks was my refrigerator. I had random produce and some fresh shrimp I bought on a whim. In order to avoid wasting produce, I decided to make soup. Soup or pasta or frittata are great ways to use up random ingredients. 1. 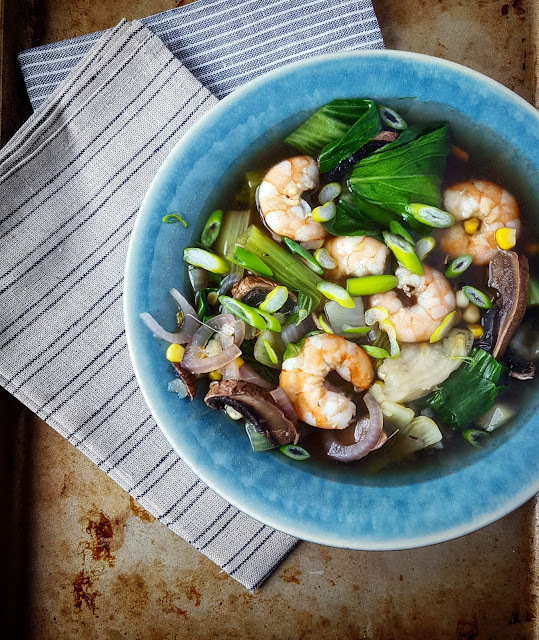 Use shrimp shells, a few garlic cloves, pepper corns and onion skins to make broth. 2. Saute sliced mushrooms in a bit of olive oil. 3. Add shrimp broth. Add sliced fennel and bok choy and simmer until the vegetables are tender. 4. Add fresh corn kernels, thinly sliced shallot and whole shrimp and simmer until the shrimp are cooked through (pink). 5. Season the soup with a bit of soy sauce and sesame oil and serve topped with scallions. This was a satisfying meal which made me feel better about not wasting food for once.